Power Stone is a fully 3D arena fighting game series made by Capcom. 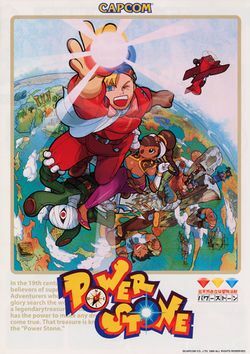 Power Stone was initially released on the Sega NAOMI hardware and later ported to the Dreamcast. Set in a steampunk version of the 19th century, strong believers of legends, myths and superstition search for fame, fortune and glory. One legend above all is sought after by many, a treasure which can make any dream come true. Believers from all over the world set out to search for this treasure, and are forced to fight against one another in pursuit of the legendary Power Stone. North American and Japanese Dreamcast cover art. This page was last edited on 6 October 2009, at 16:43.